Domaine Giraud does not have one of longer histories in the Chateauneuf du Pape region. The estate was born in 1974 when Pierre and Mireille Giraud decided to change careers from the distillery business to growers and wine makers. The Giraud family started off by renting 4 hectares of land. The Giraud family were familiar with Chateauneuf du Pape and wine making because they are related to the Armenier family, the owners of Domaine de Marcoux. The next step in growth for Domaine Giraud took place in 1981 when the family gave up their distillery business to become full time wine makers. By 1987, the estate had doubled in size. Since 1998, the domaine has been managed by Marie Giraud and Francois Giraud. 1998 was clearly a breakthrough year for Domaine Giraud. That year marked the debut vintage Giraud Cuvee Les Gallimardes, the first wine that was produced, bottled and sold by the estate. Prior to that vintage, as we mentioned, their harvest was purchased by negociants or other growers in the region. Since 2001, Marie Giraud and Francois Giraud have continued to increase their responsibilities at Domaine Giraud. Domaine Giraud has continued to expand their holdings in the Southern Rhone. Currently, they own 17 hectares of vines that are spread over 64 separate parcels in the Chateauneuf du Pape appellation. Their best vines are the Grenache that was planted more than 100 years ago in the La Crau sector. Starting in 2008, they shifted to 100% organic farming methods. With the 2011 vintage, Domaine Giraud was certified as a biodynamic estate as they only use 100% biodynamic vineyard techniques. Philippe Cambie consults the domaine. The best vintages of Domaine Giraud are: 2018, 2017, 2016, 2015, 2012, 2010, 2009, 2007, 2005 and 2001. Domaine Giraud produces 3 red wines from Chateauneuf du Pape, 1 Chateauneuf du Pape Blanc and a wine from the Cotes du Rhone appellation. Domaine Giraud Tradition – From an average blend of 60% Grenache, 35% Syrah and 5% Mourvedre, the grapes are on average close to 70 years of age. The terroir is rocks, sand, clay and limestone soils. The vines are planted in the Bois de la Ville, la Cerise, les Galimardes, le Tresquoys and Valori lieux-dits. The grapes are completely destemmed. 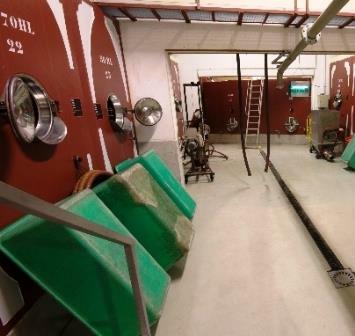 The Grenache and Mourvedre are aged in cement vats while the Syrah is aged in barrel for 12 months before bottling. The production averages between 2,000 and 2,500 cases. Domaine Giraud Cuvee Gallimardes – The wine is named after the commune the vines are planted in. Produced from 90% old vine Grenache and 10% Syrah, the Grenache comes from vines that average close to 100 years of age. The terroir is pure galets in the les Galimardes lieu-dit. Fully destemmed, the Grenache is aged in a combination of steel tanks and cement tank or steel tank, and the Syrah is aged in 10% new, French oak barrels for 12 months. The production is on averages close to 750 cases per year. Domaine Giraud Les Grenache de Pierre – Produced from 100% old vine Grenache, the vines are mostly over 100 years of age. The vines are placed in 2 vineyards, La Crau, with its clay and sand soils and in the Pignan lieu-dit, where you find more sand. 100% of the fruit is always destemmed. The wine is aged in vats and demi-muids for 12 months. The production is quite small at close to 250 cases per year. Domaine Giraud Chateauneuf du Pape Blanc Cuvee Gallimardes from a blend of Roussanne, Bourboulenc and Clairette. The production is close to 250 cases per vintage. Domaine Giraud can be enjoyed on the young side with decanting of 1-2 hours or so. This allows the wine to soften and open its perfume. Older vintages might need very little decanting, just enough to remove the sediment. Domaine Giraud is usually better with 4-6 years of bottle age. Of course that can vary slightly, depending on the vintage. In the best vintages the wine should be consumed within 5-20 years after the vintage. Domaine Giraud is best served at 15.5 degrees Celsius, 60 degrees Fahrenheit. The cool, almost cellar temperature gives the wine more freshness and lift. Domaine Giraud is best served with all types of classic meat dishes, veal, pork, beef, lamb, duck, game, roast chicken, roasted, braised, stewed dishes, sausage and cassoulet. Domaine Giraud is also good with Asian dishes, hearty fish courses like tuna, mushrooms pasta, eggplant and tomatoes. The white wine of Domaine Giraud is best served with a myriad of different seafood dishes, shellfish, crab, lobster, sushi, sashimi, chicken, pork and veal, as well as Asian cuisine. Domaine Giraud also owns 18 hectares of vines in the Cotes du Rhone and Lirac appellations. Domaine Giraud Sixte is a wine to look for from the Cotes the Rhone. This Vieille VIgnes is made from from 100% old vine Grenache that averages 60 years of age. Flowers, wild cherries and thyme shoot out of the glass. The wine is fresh, vibrant, refined and focused on its purity and elegance. There is depth, concentration, length and minerality with a real purity to the fruits that truly expresses itself here. The stunning wine is made from 100% old vine Grenache. Dark in hue, the wine offers rock and stones along with salty tannins that adds mineral nuances to the ripe, fresh, red berries. There is structure and backbone that will allow this beauty to age well. This is not a forward easy drinker, it will need time to fully express its full potential. The wine was made from blending 90% Grenache with 10% Syrah. Full bodied, intense, lush, rich and with a serious depth of flavor, the fruit is sweet, spicy, fresh, long and intense. The finish is packed with ripe, dark cherries, black plum, kirsch and peppery spices. It's hard to believe this is their entry level wine, because it's so good. The wine was produced from blending 80% Grenache, 15% Syrah and 5% Mourvedre. Deep ruby red in color, there is a complex spicy quality to the layers of red berries, pepper and garrigue, that tastes good and feels better. The purity in the kirsch really shows here. Concentrated, deep, richly textured and long, the wine was made from blending 90% Grenache with 10% Syrah. With a fabulous purity of fruit, silky tannins and a finish that does not want to quit, this just keeps on going. And that's a good thing, because I cannot get enough of all the juicy, ripe, kirsch, garrigue, wild strawberries and supple textures! The wine is made from 100% old vine Grenache. Kirsch, iron and garrigue make their presence with no effort. Silky, soft and sensuous, this elegantly styled Southern Rhone combines freshness with polished, red berries. Drink it young or age it. It's hard to believe this is their entry level wine, because it's so good. The wine was produced from blending 65% Grenache, 35% Syrah and 15% Mourvedre. Purity of fruit is the star here, with its mineral driven, smoky, kirsch profile, Supple, polished and long the sweet, fresh, red fruits really keeps the finish going. The wine was made from 100% old vine Grenache. This is one of the starts in this mixed vintage. With a blast of garrigue, kirsch and licorice, complicated by floral notes, the wine is polished, suave, spicy and fresh, with good purity of fruit and an elegant, sweet, strawberry and kirsch filled finish. Giraud les Grenaches Pierre - One of the stars of the vintage, with its pure red, sweet, ripe, polished fruits, freshness and all of its silky, spice filled, elegant charms. This beauty was produced as you might expect from the name using 100% old vine Grenache. Sweet kirsch and fennel in the nose, with a blast of soft, elegantly polished red cherries in the sweet finish. 80% Grenache, 15% Syrah and 5% Mourvedre produced the blend. Elegant in style, this lighter, fresh, kirsch filled wine is perfect for early drinking pleasure. The wine was made from 100% Grenache. Silky, clean and pure, the fresh peppery kirsch notes of the 100% old vine Grenache expand in the lush textured, pure finish. One of the stars of the vintage. From a Syrah heavy blend of 60% Grenache, 35% Syrah and 5% Mourvedre, there is a mineral component that comes through, along with fennel, fresh herb, plum and cherry tones. On the palate, there is a mouthful of sweet, fleshy, fresh red fruits and spice that lingers. Fresh cut herbs and crushed red fruits combine to produce a sweet, silky, kirsch filled wine of pure, forward drinking pleasure. Made from 100% old vine Grenache, this lush, soft and silky Chateauneuf shows good richness and sensuous textures from start to finish. There is a blast of fresh, cherry and jam in the end note that lingers. This is another star of the vintage. This delicious wine pops with flowers, cherries and earthy scents that bring you to a mouthful of freshness, flavor and silky textured, ripe, spicy, sweet red berries. There is a good prolonged sensation of freshness in the finish. The wine was produced from 90% Grenache and 10% Syrah. Kirsch, kirsch and more kirsch, coupled with spicy, peppery notes lead to an approachable, rich, sweet, silky finish. Produced from 100% old, vine Grenache that dates back more than 100 years, the wine is deep in color. This is so rich, it seems like there is enough dry, extract in this one bottle for a magnum sized format. There is a beautiful purity to the fresh, sweet, ripe and over ripe black and red berries that coupled with intensity and elegant textures, leaves a real impression on the taster. This wine really fills your mouth and coats your palate. WOW! From 90% old vine Grenache that is more than 100 years old, the wine screams with black raspberry jam, kirsch, black cherry liqueur, spice box and licorice notes. Elegantly textured, with layer after layer of dense, ripe berries, the wine ends with a lavish display of ripe fruits. I do not know where I’ve been for the past few years, because I was not aware of the level of wine coming from Domaine Giraud. Consulted by Philippe Cambie, this is one of the hottest new estates in Chateauneuf du Pape. Not only is this absolutely delicious, it sells for more than a fair price for a wine of this quality. Packed with sweet fresh, jammy berries, cherry liqueur, gariggue and peppery, black raspberries, this beauty is already delivering the goods. Another fabulous vintage from Domaine Giraud that is coming along perfectly. The wine has depth of flavor, concentration, ripe, juicy, fresh, polished red fruits and an elegant, full endnote that could not deliver any more kirsch, dark cherries and licorice if it tried. This is really showing well today. Luscious, lusty and just all out fun to drink. The round textured, fresh, juicy, sweet, ripe black raspberries, kirsch and garrigue is showing great today, if you like your Chateauneuf on the young side, like I do. Lush, fat, rich, juicy, opulent ripe fruits look, taste and feel great on your palate. Full bodied and concentrated, you find black pepper, fresh herbs, kirsch, jammy plum and thyme that stick with you from start to finish. This is in a really nice place for drinking today. A really nice with with a strong aromatic profile, full bodied and structured fruits. This is drinking quite well today. Full bodied, concentrated and a but firm, still, there is a lot like here, with all its kirsch, garrigue and spice.